Whirlpool Chest Freezers are renowned for their high quality and countrywide availability. These chest freezers are available in a variety of sizes ranging from 14.8, 17.5 and 21.7 Cu. Ft. While all the models are white and require manual defrosting, virtually all models come with a generous catalog of features. And, all 3 of the models Energy Star chest freezers. So, if you are looking to save money (via lower electric bills) while also protecting our fragile environment, chances are that you will find what you are looking for here. Plus, we’ll tell you where to buy them for up to 50% off the recommended retail price! Model: EH151FXTQ. Dimensions (WxHxD): 46.13 in x 34.75 in x 29.31 in. Color options: White. This is a great choice for anyone looking for a reliable medium-sized chest freezer. It’s Energy Star qualified, meaning that it is proven to exceed set by the US Department of Energy consumption standards by at least 20%. Selecting this chest freezer will therefore result in a substantially lower electric bill and a cleaner environment than the other "ordinary" identically-sized chest freezers. It has a solid core lid can support up to 350 lbs when closed. As such, this strong lid won’t pounce shut while you are removing or adding your favorite frozen foods to the freezer, causing head and arm injuries. The lid also makes a great worktop or temporary storage space. Using the lock and key that come as standard to this Whirlpool chest freezer gives you peace of mind that your food investment is safe and secure. Because a hose adapter is included in the box, defrosting your chest freezer need not be a dreaded exercise. Simply attach the hose to the defrost drain and channel out the thawing water. The adjustable thermostat makes it easy to set and adjust the temperature of your unit as needed to suit the storage of different food items. A steel interior gives the model a durable feel while the rounded corners make this chest freezer easy to clean. Large storage baskets help to compartmentalize your freezer, make food organization a snap. It is therefore a lot easier to retrieve those tiny items that would otherwise lay forever buried in the freezer. A 1-year warranty covers defective parts and workmanship. This gives you peace of mind as only a company with a proven track record can stand behind its brand. Note though that this model doesn't come with a temperature alarm or a power on indicator light. If you value the benefits associated with these, it is advisable to explore the larger models below. Model: EH185FXTQ. Dimensions (WxHxD): 54 in x 34.75 in x 29.31 in. Color options: White. This is the next size up and is great for you if you find the 14.8 Cu. Ft. profiled above a little small. Why are you likely to get hooked to this Whirlpool freezer chest? It’s Energy Star certified, meaning that it will be kind on your utility bill, saving you upwards of 20% of comparable non-certified, identically sized chest freezers. It consumes 400 kWh a year which translates into annual energy costs of about $43, or $3.58 a month in the US. This, in addition helps to reduce your family’s carbon footprint. A power on light lets you know the power status of your freezer at a glance, allowing you to take immediate corrective measures as needed. The key and lock keep your little ones out of harm’s way. Locking this Whirlpool freezer will keep pilfering hands at bay and also keep the door from opening accidentally and spoiling your precious food investment. An adjustable temperature control (thermostat) lets you set the precise temperature of your frozen items; whether these are fruits, veggies or meats. A temperature alarm makes an audible sound when the freezer temperature rises above freezing point, enabling you to take corrective measures to avert food wastage, such as ensuring that the freezer lid is firmly shut. It has a solid core lid that can support up to 350 lbs when closed. So it is strong enough to take your weight, and act as a worktop without caving in. A host adaptor, which is attachable to the defrost drain, takes the sting out of the often dreaded defrosting exercise. Interior lighting makes it easy to quickly locate and retrieve frozen items. 3 large removable freezer baskets make storing and locating small items a snap. Plus, because the baskets can be lifted out completely, it is easy to access items that are at the bottom of the freezer. The smooth steel interior and rounded interior edges make this model super easy to clean and consequently prevent bacterial build ups. A 1-year warranty assures you that defective parts and workmanship will be remedied free of charge within a period of 12 months after purchase. Model: EH225FXTQ. Dimensions (WxHxD): 64.94 in x 34.75 in x 29.31 in. Color options: White. The 21.7 Cu. 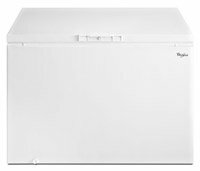 Ft. Whirlpool EH225FXTQ is the largest of the Whirlpool chest freezer suite. This chest freezer's Energy Star qualification is what sets it apart from the other large chest freezers on the market as it makes it both an environment and energy saver. The estimated energy cost of operating this freezer is US$ 49 each year (US$ 4.08 per month), 11% cheaper than similarly sized chest freezers. A temperature monitor alarm sounds when the freezer temperature rises above the safe range, enabling you to take corrective measures to immediately save hundreds of dollars in food investment. The key-eject lock does more than just secure your food investment. It is a great feature for childproofing your freezer. The convenience of the power indicator light cannot be underestimated... You don't have to plug your ear to the lid to hear if the freezer is still humming because all you need to do is glance at the power indicator light to check if it is on. With the freezer's bright interior light, storing or retrieving food need not be consigned to day time. Even at nighttime, the freezer is well lit and it is just as easy to locate that tiny packet of peas you hurriedly tossed into the freezer a fortnight ago. An adaptable hose and defrost drain take the tedium out of defrosting your unit while the dishpan bottom traps the draining water, creating less of a mess and lessening your cleaning up workload. Large storage baskets make storing and locating tiny items a lot easier. Of course, these baskets can be lifted out of the chest freezer completely in order to create room for bulky or oddly shaped items. A 1-year warranty applies to cover defective parts and workmanship. This gives you the assurance that manufacturing defects will be remedied within 12 months from the date of purchase at no cost to you.